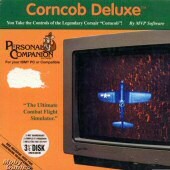 "Corncob 3D/Deluxe is an early flight sim where WW2 never happened because Hitler had a fatal injury in his youth. However, in its place, aliens have decided to invade Earth (again) because they need someone to clean their toilets (not really a joke). However, despite the fact that they can travel light years in a short span of time, they can only seem to muster projectile weapons for their invasion, and a simple 500 lbs. bomb can blow up most of their structures. Therefore, they have been unable to completely take over as of yet. Also, out of all of the planes that were developed during World War II, the only one to make it into this alternate universe is the F4U Corsair. And this sets the stage for you. You come on the scene as a pilot fighting against the aliens, based at locations dangerously near the front lines. In Corncob Deluxe, these locations include a grassland, a wasteland, an area in which missions can only be flown at night, and the aircraft testing area at White Sands, New Mexico. As far as gameplay goes, the missions are pretty unique and varied most of the time. Although most of the mission objectives involve blowing stuff up, the location and manner that you must blow them up in is quite different. For example, in one mission, you must fly to the highest altitude your Corsair can go to attack an alien power plant. In another mission, the power plant you must destroy is invulnerable to normal weapons, so you must hit it with your plane to destroy it (and eject just a moment before it hits the facility). In another mission, you must fly into a teleport gate that's near heavy amounts of alien defenses." Although the game is a little too short (only three campaigns), most missions are quite difficult to complete. With a wacky plot, a unique premise that pits WWII planes against weird aliens, and reasonably realistic flight dynamics, Corncob 3D is an enjoyable light flight sim that is well worth a look by every armchair pilot. Thumbs up! Check out the page linked below that has the history of Pie in the Sky including a few paragraphs on Corncob 3D.